I was looking for an antenna dedicated for the OIRT band, with boom length up to 4 meters. There are many ham-radio projects for 70 MHz, but unfortunately they are very narrow-band. 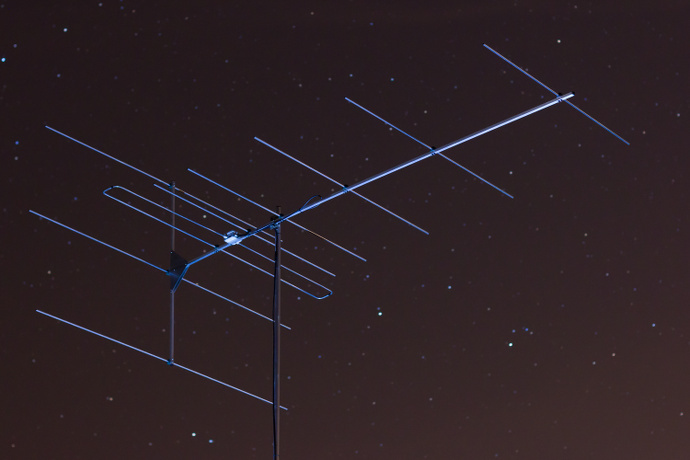 One day I decided to scale the 9-el K6STI wideband yagi. First version of my OIRT yagi was ready in April 2013. Actually, it was an antenna with 7 elements, because I haven’t included two additional reflectors. I was experimenting with the single reflector length, but finally I also added other reflectors for better F/R ratio. Why? There are no other stations coming from the back side of the antenna, however there is another unwanted source of signal – interference from high voltage power lines… Besides 65-74 MHz I also intended to cover lower frequencies starting from 60 MHz, especially for STL reception (studio-transmitter links) via Sporadic-E. I was using MMANA-GAL software for the antenna redesign and analysis. All wires are made of 12 mm aluminium, except one side of the dipole, which is 10 mm, because it was easier to build. I protected the 12↔10 mm dipole joinings with a heat-shrink tubing. I used 20×20×2 mm boom and 20×20×1.5 mm reflector boom, but more robust ones should be definitely used if possible. For details see the antenna file. Note – despite the small number of elements, this antenna is pretty huge – the boom length is almost 3.7 m and the reflectors are more than 2.5 m long. Make sure to use a reliable antenna mast. My temporary one came down during a wind storm (with gusts up to 110 km/h).